Snap reported quarterly financial results for its first time as a public company on Wednesday, posting revenue that missed estimates and slower-than-expected user growth. Shares plummeted more than 20 percent on Thursday. The company spent $2 billion on stock-based compensation expenses after its initial public offering, widening net losses for the quarter to $2.2 billion. CEO Evan Spiegel got a $750 million bonus for taking Snap public. He told analysts on a conference call that the company was focused on improving quality for users during the first quarter, especially for those with Android mobile phones. Despite the steep loss during the quarter, Snap is "still in investment mode," the company's chief financial officer, Drew Vollero, said on a conference call with analysts. Revenue: $150 million reported vs. $158 million expected by a Thomson Reuters consensus estimate. Global DAUs: 166 million reported vs. 167.3 million expected by StreetAccount. ARPU: 90 cents reported vs. 90 cents per share expected by StreetAccount. Loss of $2.31 a share including compensation expenses. Analysts at Thomson Reuters estimate an adjusted loss of 20 cents per share, wider than the 19 cents expected. That's compared with revenue of $38.8 million in the year-ago period. As the company behind the viral ephemeral messaging app and Spectacles glasses, Snap's IPO was the biggest technology offering since Alibaba. And it's growing at an extraordinary rate: Revenue rose 286 percent year over year in the first quarter. Daily active users rose 36 percent from the year-ago period, and average revenue per user grew 181 percent. More than 3 billion Snaps were made daily in the first quarter, the company said, up from 2.5 billion in the third quarter of 2016. Users spent an average of 30 minutes a day on Snapchat, the company's chief strategist, Imran Khan, said on the conference call, and cited Nielsen data showing that many Snap users could not be reached by traditional TV channels. "We made good progress this quarter improving the performance and quality of our Snapchat application, especially on Android, which has helped result in increased net user adds and engagement. We still have a lot of work to do, and are excited about the potential from continued performance improvements." But since its IPO in early March, Snap has faced an uphill battle to convince Wall Street it can make money with advertising, even with Facebook and Google dominating the market. Spiegel said that automation will help the company make more money for advertisers. "People are going to copy your product if you build great stuff. Just because Yahoo has a search box doesn't make it Google." Facebook, in particular, has pushed aggressively into Snap's turf. Boss Mark Zuckerberg told analysts that Instagram Stories has 200 million daily active users, and WhatsApp Status has more than 175 million daily active users. As a whole, Facebook has 1.28 billion daily active users, nearly eight times as many as Snapchat. Other revenue sources, like Spectacles, have hardly made a dent in the company's business. Analysts surveyed by Thomson Reuters expect Snap to post a per-share loss through the end of 2018. Snap has not made great gains in the markets, trading mostly below the high of $29.44 in its first week of trading. Indeed, the stock fell as low as $17.07 after hours, just 7 cents above its IPO price, as shares changed hands in heavy volume. When Facebook, Yelp, Twitter and LinkedIn reported their first quarterly results as public companies, the stocks fell by an average 14.1 percent the next day, according to Jim Strugger, derivatives strategist at MKM Partners. Snap should have set its expectations lower, Art Hogan, chief market strategist at Wunderlich Securities, told CNBC's "Closing Bell" on Wednesday. He explained that a company's first earnings report as a public company is "really dependent" on executives giving realistic guidance. But that's just part of the growing pains of becoming a public company, Hogan said. COMMENTARY: I won't lie to you, I am not a fan of startups with unproven or unsustainable business models and no evidence of profitability. In my opinion, Snap Inc has many similarities to Twitter: 1) user growth slowing down at time of IPO filing, 2) lack of profitability and 3) small market focus (primarily Millennials). Snaps has positioned itself as a "camera app" that allows Millennials, its core user demographics, to share photos that automatically disappear. In a blog post dated October 10, 2016, I commented on Snap Inc's proposed $25 billion IPO. Like Twitter before it, I had a lot of reservations about the Snap IPO, because there were already strong signs that user growth was slowing down, and many analysts like myself, felt that Snap's business model, which depended almost entirely on advertising, was unsustainable. Furthermore, Snap derived the majority of its ad revenue from the U.S., so in order to sustain growth, this required expanding its user base internationally. Snap is very slow in providing advertisers with the tools they need to target potential customers, and this is the same thing that plagued Twitter's ad revenue growth. On May 4, 2017, Snap announced a suite of tools to help advertisers market to its users more effectively. If you ask me, they should've done this much sooner. According to an announcement on May 4, 2017, starting this June, Snap is going a step further by flinging wide its gates to advertisers of all sizes and budgets with a new suite of self-service tools. The move could help considerably grow Snap's fledgling ad business, which is expected to reach $1 billion in revenue this year. Releasing a self-service ads manager is intended to erase any friction that may be keeping advertisers off Snapchat, a company spokesperson told Business Insider. Snap expects larger buyers to still go through one of its auction partners, which offer more custom targeting like timing ads to run alongside TV campaigns or during specific weather conditions. Snapchat's new ads manager will let any advertiser buy, manage, and view reporting for their campaigns. All ad formats, including app install ads, sponsored geofilters, and fullscreen video, are available alongside existing targeting capabilities like goal-based bidding. The manager is free to use and requires no minimum ad spend. A new mobile dashboard will also allow marketers to see their ads like a normal user, view analytics, and get notification updates about their campaigns directly from the Snapchat app. Over 20 brands are testing these new tools now as part of a private beta, and Snap plans to make them available to everyone in June. eMarketer estimates that Facebook will generate $36.29 billion in net digital ad revenue in 2017, up 35% from last year. That would give it the second largest share of the global online ad market with 16.2%, behind Google’s 33%. 45% of Facebook ad revenue is expected to come from the US. While Facebook doesn’t break out Instagram financials, eMarketer expects it to earn $3.92 billion in global ad revenue, or 12.3% of Facebook’s ad revenue. eMarketer analyst Debra Aho Williamson is bullish about Facebook as an advertising platform but says. COMMENTARY: In a blog post dated May 21, 2012, I had predicted that Facebook's IPO had been over-hyped by investers in the pre-IPO secondary market, and that this could result in a further erosion in the share price, and possible share price collapse. This in fact happened, and by August 17, 2012 (see my Blog post), Facebook shares had dropped to new low of $19.87 from their IPO closing price of $38.23. I made jokes about Facebook, calling the social giant "Faceplant." It wasn't until August 23, 2013 that Facebook shares slowly creeped back to exceed their closing IPO price $38.23, by reaching $40.55. A lot of pre-IPO investors waited over nine months to recover their investments. Many investors, like yours truly, bailed out of Facebook and took a loss. I lost over $1,200 myself. I thought at the time that Facebook was one of my worse investments, and I was probably not the only one. Facebook went into their IPO without a detailed strategy and sustainable business model for generating advertising revenues from mobile users. So the month before the IPO, Facebook acquired Instagram, a mobile photosharing app, for $1 billion. The strategy was to use Instagram as a platform for mobile advertising. However, it wasn't until Q4 2012, that Facebook was able to deliver on its promise to investors, that it could monetize mobile users. In Q4 2012, mobile ad revenues were $305 million or 23% of total ad revenues. The rest is history, of course, as Facebook now dominates all social media sites in mobile ad revenues. For the year ending December 31, 2016, mobile ad revenues constitute 84% of Facebook's $27.6 billion total ad revenues for the year 2016. Google Play widened its lead over iOS in worldwide downloads; however, iOS maintained its lead in worldwide consumer spend. The first quarter of 2017 saw record levels of worldwide app downloads and consumer spend. iOS and Google Play downloads grew 15% year over year — to nearly 25 billion worldwide. This is an incredible feat since this number only reflects new downloads and is not inclusive of re-installs or cumulative downloads from past quarters. Gross consumer spend also grew at an impressive 45% year over year in Q1 2017 to well over $15 billion across iOS and Google Play worldwide. This figure only partially represents how publishers can generate money through apps since it does not include revenue from m-commerce or in-app advertising. The app market is soaring as consumers migrate more of their lives to mobile and pay for the ease, convenience and accessibility that apps offer. Google Play widened its lead over iOS to 135% for worldwide downloads in Q1 2017, up from a 100% lead back in Q1 2016. It saw both the greatest absolute growth and the fastest growth rate year over year out of the two stores. Google Play grew 20% year over year, fueled largely by growth in emerging markets like India and Indonesia. India is still in the early stages of the App Market Maturity Cycle. The incredible rate of downloads the region is currently experiencing is the result of consumers trying out new apps before app habits form. Smartphone penetration in India is below 30%, which paints a rosy picture of long-term growth. As more consumers adopt smartphones, we expect India to continue to contribute significant download growth in the quarters to come. While Android devices dominate in India and drove Google Play downloads in Q1, India was also a chief contributor to growth in iOS downloads, second only to China. China remains a vital market for the iOS App Store, and as downloads continue to grow, consumer spend follows. Overall, the iOS App Store saw a healthy growth rate of 5% year over year in Q1 2017; however, it’s when looking at consumer spend that the App Store’s leadership really comes into focus. iOS increased its lead to 100% in consumer spend over Google Play in Q1 2017, up from 90% in Q1 2016. It saw impressive consumer spend growth of 45% year over year in Q1 2017 along with the greatest absolute gains in consumer spend out of the two stores. Given China’s rise to the #1 country by iOS consumer spend, it’s no surprise that China was a chief contributor of growth. China saw both the greatest absolute gains in iOS consumer spend and the largest growth in market share of worldwide iOS consumer spend year over year. Our App Store Forecast predicts that China will remain the largest single market for app store spend through 2021 and is poised to hold its title as the largest single market for iOS consumer spend in the years to come. Google Play also saw strong growth — consumer spend grew 40% year over year. While emerging markets fueled much of the download growth, mature markets were the biggest contributors to growth in consumer spend. South Korea and the US saw the greatest growth in market share of worldwide Google Play consumer spend, but Japan and the US saw the largest absolute growth year over year. While the largest contributors to growth in consumer spend on both Google Play and iOS have come from Asia and the Americas, Europe plays an integral role in driving consumer spend on both stores. The United Kingdom, Germany and France represent three of the top 10 markets for both Google Play and iOS consumer spend in Q1 2017, a trend which has held true for the past five years. Q1 2017 saw record levels of downloads and consumer spend in the app economy, with particularly strong growth in consumer spend across both stores. With app stores showing undoubtedly healthy growth, one thing is certain: The app economy is nowhere near peaking. Apps are an integral part of consumers lives across the world. Businesses need to adapt to this mobile-first world or be left behind in this booming economy. COMMENTARY: According to a new App Annie report released on March 29, Apple will lose its lead over Android in terms of revenue generated by mobile apps this year. However, the firm’s estimate is based on including third-party Android app stores in its forecast, not just Google Play. When the Apple App Store is pitted against Google Play alone, Apple is expected to maintain its lead through 2021, the report says. App Annie is predicting worldwide mobile app downloads to surpass 352 billion in 2021, with gross consumer spend across all the app stores to surpass $139 billion. The iOS App Store will account for a large chunk of that spend, as it’s expected to generate over $60 billion in 2021. Google Play will generate $42 billion, and third-party stores, $36 billion. Those third-party stores – which include the Android app marketplaces offers by Tencent, Baidu, Xiaomi, Huawei, and others – accounted for $10 billion in revenue last year, and will grow to $20 billion in 2017, the report estimates. The market for Android apps is growing thanks in large part to mobile adoption in China as well as other emerging markets, particularly Mexico, Brazil, and Indonesia. This will impact app downloads, too. Android downloads from both Google Play and elsewhere will at an annualized rate of 23 percent to 299.9 billion by 2012. App downloads are more evenly distributed across countries around the world, but revenue is another matter, App Annie also found. According to its data, the top five countries by downloads – China, India, U.S., Brazil, and Indonesia – accounted for 54 percent of the downloads last year, and this won’t change much through 2021. However, the top countries by revenue – China, U.S., Japan, South Korea, and U.K. – accounted for 75 percent of app store revenue in 2016. This is expected to grow to 85 percent by 2021. The firm chalked up this shift to increased spending on games and subscriptions from existing smartphone users in mature markets like the U.S., Japan, and South Korea, but especially the maturing market that is China. China, because of its vast population and growing middle class, still plays a key role when it comes to app store revenues, but its market is maturing, the report notes. The majority of Chinese app users are expected to settle into patterns of habitual use by 2021, which will allow revenue growth to be sustained even though downloads may slow. Downloads in China will grow at an annualized rate of 19 percent from 2016 to 2021, while consumer spend will grow 24 percent to $56.5 billion. In larger cities, much of the smartphone market in China is already saturated, meaning a lot of growth will come from other regions across the country. India, on the other hand, is still in the early stages of the app market maturity cycle, and will see significant download and revenue growth through 2021. Downloads will grow 28 percent to nearly 23 billion by 2021, and app store spend will grow an annualized rate of 75 percent to $2.1 billion. Despite India’s growth, consumer spend will be lower in the region because of a variety of factors, including more limited purchasing power and a culture that focuses more on saving versus spending on games and entertainment, App Annie says. It suggests that app developers targeting India consider other revenue models, like advertising. For the first time, more than half — or 51% — of the record $72.5 billion spent on digital advertising in the U.S. last year was on mobile ads, according to a report conducted by PwC US for the Interactive Advertising Bureau (IAB). First reported by The Wall Street Journal, those numbers represent a 77% surge of spending on mobile advertising to $36.6 billion last year, according to the IAB. Digital ad spending in general grew 22% in the U.S. from the previous year. David Doty, the IAB’s executive vice president and CMO, told WSJ. A big chunk of that mobile growth was driven by Facebook and Google. Other key findings of the report include growth in online video ads, in which spending jumped 53% to $9.1 billion. Mobile video spending grew by 145% year-over-year to nearly $4.2 billion. Digital audio advertising crossed the $1 billion spending mark for the first time in 2016. Those figures also include ad revenue generated by streaming services and podcasts. For months, the Association of Magazine Media has tracked online magazine audiences' shift from desktop to mobile devices, in its monthly Magazine Media 360° Brand Audience Reports. In February, the report found Web audiences using desktops or laptops had dipped by 14.2% compared to the same month a year ago, while mobile audiences were up 2.9%. Interestingly, the March report from MPA revealed mobile audience decreased by 1.3%, the first report that showed even a slight decline in mobile magazine audience. An MPA spokesperson said in an email. Social Media advertising revenue totaled $16.3 billion for 2016, compared to $10.9 billion in 2015. For the second half of 2016, Social media revenue was $9.3 billion. Year-over-year, Social media revenue was up 49% from FY 2015. Social continues its half-year growth trends - increases are reflected in the 54% compound annual growth rate of social from 2012 to 2016. Social’s growth continues to play a key role in the growth of Mobile, as Social is a significant activity on Mobile. Note: We define social media as advertising delivered on social platforms, including social networking and social gaming websites and apps, across all device types, including desktop, laptop, smartphone and tablet. The gap between desktop video and Mobile video is quickly closing In FY 16, mobile video revenue was 85% of desktop video revenue. Total digital video, including mobile and desktop, rose to $9.1 billion in FY 2016, up 53% from $5.9 billion in FY 2015. Digital video on smartphones and tablets continued strong triple-digit growth, reaching $4.2 billion in FY 2016, an impressive 145% rise from FY 2015. 46% of video ads were displayed on a mobile device in 2016, up from 29% in 2015. On desktop, digital video was the key growth driver, increasing 16% over FY 2015. Mobile growth is driving demand for digital video advertising. Mobile now represents just over half of internet advertising, 50.5% in 2016, up from 34.7% in 2015. When we reallocate mobile activities to traditional formats, we note that digital video grew more than 50% from the previous year. Display-related formats grew more than 25% 2016, when mobile revenues are included. In 2016, revenues from Audio advertising, particularly streaming music services, were significant enough to begin tracking within this report. Below are the FY 2016 revenue figures for desktop and mobile. Beginning in 2017, this category will be tracked for growth on desktop and mobile, with the latter being the clear revenue driver. Approximately 64% of FY 2016 revenues were priced on a performance basis, down from the 65% reported in FY 2015. Approximately 35% of FY 2016 revenues were priced on a cost per medium/thousand (CPM) or impression basis, up from the 33% reported in FY 2015. Approximately 1% of FY 2016 revenues were priced on a hybrid basis, down from the 2% reported in FY 2015. The Samsung Galaxy S8 is the nicest phone I’ve ever held. It’s a beautiful combination of glass, metal, and an absolutely massive screen in a body that’s much smaller than you might expect. And that might not be enough to make it stand out anymore. S8 Plus with a larger 6.2-inch screen. Both are available for preorder on March 30th and will be shipping in the US on April 21st. Pricing, as always with Samsung, is up to the carriers — but you can expect them to command a premium price. The early word is that it will start at $720. Here’s everything we learned about these two phones after using them for an hour or two last week. Holding the S8, I’m struck by the fact that nothing about it feels especially surprising, and not just because damn near everything about it has been leaking for the past few months. The boldest feature is every phone’s more important feature: the screen. On the S8, it extends up and down to cover nearly the entire front of the phone. It also curves around the left and right, something Samsung is calling the “infinity display,” which gives it the look of not having any bezels at all. And speaking of curves, the four corners of the screen are also slightly curved instead of squared-off, which adds some elegance and perhaps some screen durability. The S8 and S8 Plus fulfill Samsung’s promise of fitting a big screen in a smaller body, and so they’re quite a bit more usable than other large-screened phones. I didn’t experience some of the accidental touch issues that I still get with the Galaxy S7 Edge. But I also only had about an hour with the phone, so it’s possible that it could still be an issue. More than anything else, the S8 is nice. It may seem like table stakes in 2017, but these phones are incredibly well-designed. There are no seams, only the barest of camera bumps, and everything seems milled down to sub-millimeter tolerances. They feel inevitable in a way that almost becomes boring. Many of the design touches are evolutions of the S7 Edge and Note 7, but refined to their Platonic ideals. Extending the screen to near the bottom of the phone means that there’s no room for Samsung’s traditional hardware home button. Instead, it uses software buttons like other Android phones. It also uses some haptic feedback like Apple’s iPhones to create a virtual feeling of pressing a home button, though it only works on the very specific spot where the software home button appears. One neat feature: some Android apps hide those main Android buttons when they go full screen, but you can still firmly press the bottom of the screen to activate the home button. Getting rid of the physical home button also means that Samsung had to move the fingerprint sensor. It’s on the back now, right next to the camera. That’s not a very convenient place for it, honestly. It’s too high up on the phone to comfortably reach and it’s also right next to the camera module, which might mean you’l be getting fingerprints on the camera more often than you’d like. Speaking of fingerprints, because the S8 is nearly all glass, you’ll see them on the back a lot, but they’re not as prominent as you might expect (they’re worse on the LG G6, for example). Both the USB-C port and the 3.5mm headphone jack (hallelujah) are located on the bottom of the phone. You have power on one side and volume buttons on the other, underneath which you’ll find a whole new button that’s dedicated to the big new software feature on the Galaxy S8, Bixby. There’s much more on Bixby below, but for now I’ll just note that dedicating a hardware button to this software feature is a big bet on Samsung’s intelligent assistant. If Bixby ends up being not that great, I expect many people will be looking for ways to remap that extra hardware button (or decrying that it’s vestigial). As you’d expect, the S8 has the best specs you can get on an Android phone. Depending on the region, you’ll either get Qualcomm’s newest (and slightly rarer) Snapdragon 835 or Samsung’s own Exynos. In both cases, Samsung is touting that they’re built on a 10nm chip, which should theoretically help with power consumption. In my brief time with it, everything was whip-fast. Hopefully it will stay that way over time — Samsung phones often don’t. The standard S8 has a 570ppi 5.8-inch screen, with a resolution of 2960 x 1440. The S8 Plus has the exact same resolution on its 6.2-inch screen, which works out to 529ppi. For my money, the standard S8 is the way to go. It still feels like a massive screen and the body is significantly smaller. The height of the screen is interesting, too: the aspect ratio is a super-tall 18.5:9, which adds a bunch of screen real estate to scroll through. I didn’t get to test a bunch of third-party apps, so hopefully we won’t see too much weirdness with the new aspect ratio. Even if we do, Galaxy phones are popular enough to prod developers to update their apps to support it. In terms of other specs, it’s pretty bog standard stuff: 4 gigs of RAM, 64 gigs of onboard storage, and an expandable SD card slot. Nearly 900 words in and I haven’t made an exploding phone joke (you’re welcome, Samsung). But now is the time to point out that the last time the phone maker released a phone this big and beautiful, it literally set itself on fire on a disturbingly regular basis. The company’s responses to this issue were botched and bad for some time before it pivoted, apologized, and introduced a new process for checking battery safety. Those safety checks are important, but Samsung still has to own all the exploding phone jokes and hear them at every mention of its phones for a while. So on the S8, Samsung did not push the envelope when it comes to capacity. The S8 has a 3,000mAh battery and the S8 Plus has a larger 3,500mAh battery — the same capacity that the Note 7 had. But neither is especially large when you consider the fact that they need to power towering screens. Samsung claims it has tweaked the battery chemistry to help the batteries last longer after a year or two of use. To make up for it, Samsung is offering the usual suite of power options: Qualcomm Quick Charge and support for both major wireless charging standards. But I still have reservations about how long the batteries will last on these phones. 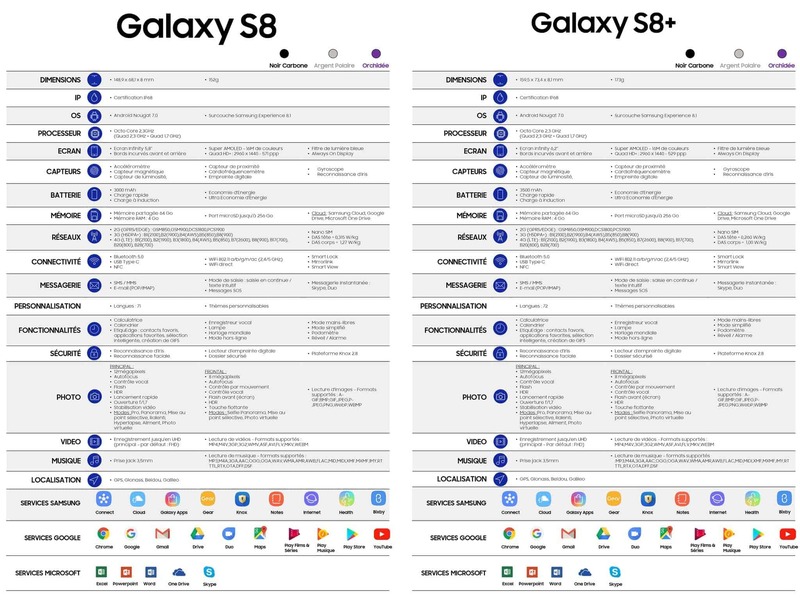 In fact, it may be a reason to seriously consider getting the larger S8 Plus. Another place where Samsung hasn’t really pushed the envelope is the camera. The S8 uses the exact same rear camera as the Galaxy S7, a 12-megapixel sensor with OIS. Samsung says it’s done work on the software side to improve picture quality, and in my short time with it I found it to be significantly faster than the camera on the Galaxy S7 Edge. It is notable that the S8 Plus doesn’t get a better camera or a dual-camera setup. Excepting screen and battery size, both phones are identical. I suspect it’s using the “take pictures all the time in the background and just save them when you hit the shutter button” trick we’ve seen on other phones. It also borrows another trick from other Android phones: the shortcut to launch it is double-pressing the power button now (since the home button is virtual). The front-facing camera (aka the one you really care about) has gotten an upgrade. It’s an 8-megapixel sensor now, but more importantly it has autofocus. Switching between cameras was fast and easy, as was swiping over to get to Samsung’s kajillion photo gimmick settings. But some of those gimmicks are pretty neat, I’m especially fond of the GIF mode, though I do wish it was just automatic like you can do with Apple’s Live Photos and the Motion Stills app. In any case, the competition for the “best smartphone camera” is way more interesting now than it was a year ago, when just Samsung and Apple were at the top. Now, Apple and LG are sticking multiple cameras in their phones while Google’s Pixel has jumped to the top of the Android camera quality game. It’s too early to say that Samsung is resting on its photography laurels with the S8, but it is fair to say that there’s probably nothing here that will give other companies reason to worry. That Samsung is capable of making great hardware should come as no surprise to anybody. It’s the software where we have reason to be skeptical. Running all the way back to the bad old days of TouchWiz, Samsung has a well-earned reputation for taking Android and mucking it up with bad ideas. For the past few years, though, the common refrain has been restraint, and I’m going to repeat it again today. Samsung has done a pretty good job keeping its worst instincts in check. There are a ton of weird features to find in the dark recesses of the settings menu, but out of the box the basic look, feel, and functionality of Samsung’s Android skinning is pretty good. And there are some genuinely great parts, too. The iris scanning that lived all-too-briefly on the Note 7 is back, if you’d like to unlock your phone that way. But the best way to unlock the phone is Samsung’s new face detect system. It takes about 20 seconds to set up and once you do, it works really well. It’s not the same, bad face unlock that was introduced in Android years ago, it’s an entirely new system Samsung made. In my 10 minutes or so of playing with it, it didn’t fail to unlock a single time. In fact, it was so fast that we a hard time filming it. I had to point the phone away from my face and then just tilt it up to look at myself. I unfortunately forgot to print a glossy 8 x 10 of my face to test with, though, so I can’t say if maybe it’s tuned to be a little too forgiving when it tries to see if it’s you. Samsung admits the face-detect system is less secure than the other ways of unlocking, so you will still need to set up the iris or fingerprint scanners to make payments. There is one gimmick that in theory I should be excited about but in practice I’m just not: DeX. It’s a feature where, after buying a specialized dock, you can plug your Galaxy S8 into a monitor, keyboard, and mouse and get a full desktop mode. Unlike solutions we’ve seen in the past (RIP Motorola Atrix), the desktop mode here simply offers Android apps instead of a full desktop browser. It looks well-designed for what it is, offering full access to your notifications and resizable windows. But it can’t escape the fact that outside a few apps like Samsung’s own browser, Microsoft Office, and Adobe’s creative suite, Android apps are bad on big screens. People who unironically call themselves Road Warriors like they’re IT managers in 1999 will love it. The rest of us probably won’t use it. And that’s fine. Samsung may not have put a ton of effort in changing its hardware design language, updating its camera, or packing in a bigger battery. But it has been focused on figuring out how to make software that people actually like, and it’s all centered on a new virtual assistant called Bixby. A short-press of the button takes you to Bixby Home (you can also swipe over to it from the home screen). Long-pressing the button turns on Bixby’s voice features. There’s a small button on the camera app for Bixby’s augmented reality features. Let’s start in the middle with voice, because speaking to Bixby is the most interesting and challenging set of features here. Essentially, what Samsung is trying to do is create a new kind of virtual assistant, one that helps you use the device directly in your hands rather than ask random questions from the cloud. I wasn’t able to test this myself, unfortunately, but Samsung did run us through a couple demos. In one, you can open the gallery app and then issue voice commands for editing a photo rather than trying to dig through the interface to find the right button. “Bixby, rotate this photo left,” and “Bixby, send this photo to Dan.” If you live that Samsung Life, you can use Bixby to send videos to your TV or turn off your smart lights, too. The goal is that “anything you can control with touch, you can also control with voice.” It’s a laudable goal, but it’s also one I very seriously doubt Samsung can achieve. For one thing, it only works with about 10 Samsung apps at launch. Also, it can only work with apps that are written to support Bixby. Unlike Google Now on Tap, Bixby doesn’t do any screen reading to try and guess what’s on the screen. So it might be a virtual assistant, but it’s very far from an artificial intelligence. The other big question with Bixby is how exactly is it differentiated from the Google Assistant. It seems pretty clear, but then you discover that there’s a bunch of overlap. For example, you can do things like set alarms with Bixby. There’s also Bixby Home, which so far as I can tell is a giant, random set of information cards for things like your smart light bulbs, fitness data, local news and weather, and whatever else Samsung thinks belongs in a virtual assistant home screen. It looks like every widget screen you’ve ever seen on a phone, which is to say it looks like sort of a mess that you probably won’t use very much. Last but certainly not least are Bixby’s camera features, which are Bixby’s best features. You can launch it either directly in the camera app or from Bixby Home, and what it essentially does is turn your camera into a photo search machine. Point the Bixby camera app at anything and it will identify it and suggest web searches for it. I tried on flowers and it gave me options to buy flowers on Amazon or look at more flowers on Pinterest. It wasn’t able to precisely identify my Android Wear watch, but it did know it was a round watch and offered to let me buy a real one on Amazon. It also works with more prosaic things. Samsung ran a demo with wine labels and book covers, both easily identified and given options to buy. Samsung says it’s working with specific partners for Bixby — including Amazon and Pinterest — but it doesn’t appear that it works with the biggest search engine of them all, Google. That’s not really a surprise. In the US, the S8 and S8 Plus will come in black, gray, and silver. Gold and blue are options internationally. The Galaxy S8 and S8 Plus are available for preorder starting tomorrow, March 30th, and you should get a free Oculus headset with a controller and a set of games along with your preorder. The official release in the US is on April 21st. Unfortunately, Samsung won’t confirm pricing, leaving that to its carrier partners — again, it looks like it’ll start at around $720. COMMENTARY: I was so impressed with the new Samsung Galaxy S8, that I pre-ordered a Galaxy S8 Plus on Thursday, March 30. T-Mobile, my wireless carrier, is running a special promotion, offering a FREE pair of Samsung VR goggles with each new phone ordered, while supply lasts. This is my fourth Samsung Galaxy phone, and I see no reason to change handsets. I hope I made the right choice. Snap, Inc. is reportedly preparing an IPO that will value the company formerly known as Snapchat at around $25 billion. The social darling is shooting for a March offering, The Wall Street Journal reports, citing sources. A company representative declined to comment on the report, on Thursday. Standing in stark contrast to struggling social networks like Twitter, Snapchat is presently making more money than it can count. Indeed, despite direct competition from Facebook and other tech giants, the company is positioned for “explosive” growth in ad revenue over the next few years, according to a recent forecast from eMarketer. The research predicts that the playful messaging app will generate $366.69 million in ad revenues this year. That figure is expected to jump to $935.46 million, next year. Cathy Boyle, principal analyst at eMarketer, recently said Snapchat’s bright outlook has everything to do with its young user base. Boyl notes in a report. To its credit, Snapchat has also tailored its ad strategy specifically for this easy-to-alienate demographic. Stateside, Snapchat’s Discover feature generates 43% of ad revenue, which is its largest single share, according to eMarketer. Next year, however, the research firm expects Stories to overtakes Discover as the dominant ad revenue source -- by generating 37.8% of the company’s domestic ad revenue. Having launched its ad platform in mid-2015, Snapchat still only captures 2.3% of social-networking dollars, eMarketer estimates. That’s despite the fact that it now commands 36% of the market in terms of domestic users. Approaching its would-be IPO, Snapchat continues to experiment with new categories. Bounding into hardware and physical fashion, the company recently unveiled Spectacles -- stylish video-recording sunglasses that are expected to retail for $130. Set to hit shelves later this fall, the shades can record 10-second video snippets, which are designed to approximate one’s natural field of vision. That's thanks to a 115-degree lens, which records circular video. If Spectacles are well received, Snapchat would become the first company to convince consumers to wear connected gadgets on their face. Google notoriously spent millions of dollars in development and marketing dollars, before giving up on its Glass initiative. Yet Snapchat -- which just rebranded itself as Snap, Inc. -- seems to have learned a few things from Google's failure. Spectacles’ $130 price tag is far more reasonable than the $1,500 that Google tried to charge people for Glass. Snapchat’s glasses are also being sold as a single-purpose device, which is historically much easier to market. like Google, Snapchat currently enjoys a strong bond with young consumers -- the ideal demographic for starting trends and popularizing products. Although bold, Snapchat’s move into hardware should not come as a complete surprise to industry watchers. The social darling recently joined the industry group that runs the Bluetooth wireless standard, which followed several hires and smallish acquisitions in the arena of consumer electronics. COMMENTARY: I have to confess that I have not followed or even taken the time to use and evaluate Snapchat because I am most definitely not in their demographics. The idea of posting photos that dematerialize is something that just does not interest me. I ask the question: Why do I need this? I could not bring myself to come to a practical answer. On the other hand, I wasn't in Facebook's demographics either, but now everybody seems to be using the social giant site to connect and engage with users throughout the world. Now comes the news that Snapchat is coming out with Spectacles, their first foray into cnsumer electronics. Didn't Snapchat's founders realize how intrusive taking someone else's picture without their permission can be? Google found this out when they introduced Google Glass, their augmented reality glasses. The cost for a pair of Google Glass was also prohibitively expensive. Maybe Snapchat will have better luck. Millennials are pretty impulsive, and love trying the latest in consumer electronics devices. They make the lions share of early adopters. The price is just right for Millennials, who are strapped for cash and carry a lot of debt, mostly from student loans. The glasses look "retro cool," but they don't rock my world from a designer standpoint. On the other hand, Spectacles differentiate the company from Instagram and Twitter's Vine and Periscope which also allow users to exchange video content via mobile devices. However, it still comes down to a sustainable business model, and Snapchat only began running ads in mid-2015. In my opinion, this is not a very long time to prove the sustainability of their business model. The big news of the day is that Snapchat is planning a $25 billion IPO. I smell another Twitter IPO in the making. A startup that just began making money from ads in md-2015 is not reliable proof of a sustainable business model. Snapchat relies exclusively on Millennials, and that market although large, and soon to be the largest demographic segment in the US, is not broad or mainstream like Twitter or Facebook. Another question: How profitable is Snapchat? If they are anything like Twitter at this stage of their development, they are probably not profitable. Both Twitter and LinkedIn (recently acquired by Microsoft) were never profitable, so I would be very cautious about investing in a startup with such a narrow demographic focus. I am dying to review Snapchat's S-1 filing. It should help answer a lot of investor concerns, and validate my own suspicions and doubts. Two years ago, Twitter-owned Vine was growing like kudzu. It was widely embraced by both consumers and marketers who sought to push the envelope with creative six-second clips. But the explosion of new video formats on Facebook, Snapchat and YouTube, which all now boast sizable scale, has caused top brands to quietly slip away. Tyler Hissey, senior digital strategist at Hill Holliday, explained. "Over time, it became difficult for many marketers to achieve scale [on Vine]. In the last six months or so, brands have started to de-emphasize Vine as a channel because of the targeting capabilities on all these other platforms." Data is proving this out. Video analytics firm Tubular Labs reviewed Vine, Instagram, Facebook and YouTube accounts of 40 major brands, including Coca-Cola, Target and Dunkin' Donuts. Between September and November, marketers posted 2,500 social videos, and Vine contributed just 113 of those clips—equivalent to 4 percent of branded content. Only 13 of the 40 brands posted to Vine during the third quarter of 2015, down from 21 in the first quarter of this year, Tubular found. General Electric—renowned in marketing circles as an early adopter of new platforms—hasn't posted to Vine since last January, while social-savvy Mountain Dew's account doesn't appear to have been touched since April. Tubular Labs co-founder Allison Stern said. "I assume that brands are having this platform fatigue. Marketers today are savvy about experimenting on a platform, but if it's not working for them, they're going to drop it." One of the main reasons brands are turning away from Vine is because unlike its competitors, Vine doesn't have an advertising model, although brands often buy Twitter ads to promote their clips, noted Topher Burns, group director of distribution at Deep Focus. "In terms of a distribution channel, Vine fails in comparison to what we'd expect from the other three [platforms]." All that said, Vine still shines when social stars are involved. Instead of brands posting their own content, Burns said that clients are looking to team up with top influencers who have amassed massive followings to create sponsored content. For example, when Dunkin' Donuts recently sought to promote its mobile app, it tapped social media star Logan Paul to create funny sponsored Vine and Instagram posts around its stores. The coffee seller used Twitter to push Paul's goofy clip, which shows him throwing a box of donuts in the air and has accumulated more than 3 million loops—Vine's view metric—in the past month. Melanie Cohn, social media marketing manager at Dunkin' Donuts said. "We find that Vine videos fulfill our fans' need for pure entertainment that they can't really find anywhere else." Tom Buontempo, president of Attention, agreed that influencers boost branded content on Vine, but noted that his shop is getting more Snapchat work as social media stars look to build audiences across multiple platforms. "Like a media property, they're looking to expand their footprint as much as they can. We're doing more Snapchat campaigns through influencers than we are for any other platform right now." Still other agency execs contend that Vine's problems stem from Twitter's sales pitch. Twitter is beefing up its advertising offerings for brands with new native video formats, livestreaming app Periscope and Niche—a platform that connects brands with creators—but Vine is often treated as an afterthought. Mark Book, vp, director of Digitas Studios said. "It seems to be a bit on the back burner as of late. It is incredibly challenging to weave a brand or product narrative into a piece of content in six seconds. We have seen success with stop-motion and live events that tell a larger, real-time story, but those opportunities are few and far between." According to AdAge, Twitter's plan to make money from Vine and Periscope looks a lot different from the strategy it's pursuing with its core product. Neither video platform will feature traditional, force-fed advertising, at least in the near term, according to Joel Lunenfeld, Twitter's VP-global brand strategy. Instead, Twitter is working with brands to promote content from these platforms within its core product, and serving as a middleman between brands and stars with major social followings. Mr. Lunenfeld said at the Collision tech conference in Las Vegas in May 2015. "As of right now we don't have plans for promoted Vines or promoted Periscopes." For now, that means Twitter will likely lean heavily on Niche, a company that connects brands with social media all-stars. Twitter acquired Niche in February for a reported $30 million. Niche, Mr. Lunenfeld said, has relationships with 10,000 social media "creators" and is especially well connected on Vine. Twitter makes money from Vine, a personality-driven platform, by connecting brands with talent. Those stars, who command massive followings, then create branded content on the platform. Brittany Furlan, one such star, is followed by 9.1 million people, for instance. Nash Grier, another star, is followed by 11.6 million people. "A brand or an ad agency comes to us and says, 'I'm launching a new product; it's targeted to this audience.' We'll say, 'Okay, here's 15 people [and] five of them, alone, have a combined audience bigger than BuzzFeed.'" HP, in one case, used Niche to find talent to create ten Vines promoting the launch of a convertible laptop. The Vines were so engaging, Mr. Lunenfeld said, that the company turned them into a 30-second TV ad. He said. "We knew there was something special there, and the backend metrics showed that purchase intent, brand awareness, all those things went up." Twitter must be careful with its approach to advertising on Vine. The community on the platform is tight-knit and not likely to respond positively to ads forced into their streams. Instagram, another visual platform, faced a backlash when it introduced ads. "We're really focusing on building the product, the experience and the community first. Then we've got strong relationships with every advertiser to learn how to promote that through Twitter proper." In conclusion, Twitter has no plans to convert Vine and Periscope into advertising platforms. Brands use the Twitter platform for engaging with its fans, and this is where promoted ads and videos will be placed. Having said this, it is important to distinguish between Twitter's Vine app adoption by brands and individual Twitter users. By the third quarter 2013, Vine was the fastest growing mobile app in the world with 23.65 million users and grew at 403% during 2013. Instagram had 109.7 million users, but only grow 130% during 2013. Twitter does not publish Vine statistics, but I found that The Social Media Hat compiled the following Vine statistics taken from different sources. In a blog post dated October 29, 2015, I reported that Twitter had 320 million monthly active users during their Q3 2015 earnings conference call. User growth has stagnated and remains in low single digits on a quarter-to-quarter basis. Increasing user growth and engagement and making Twitter easier for everyone to use is the biggest challenge facing CEO Jack Dorsey. Video advertising has taken a foothold on Facebook, and this is widely accepted as the most effective means to reach consumers. You can expect that Twitter will follow suit, and that Vine and Periscope video ads will play a major role in their advertising strategy.